New research, promoted by copyright holders, concludes that Australia's pirate site-blocking efforts are paying off. The court-ordered blockades have effectively limited the number of direct visits to blocked sites. Whether the effect is as pronounced as claimed is unclear though, in part because VPN usage is not accounted for. Australian copyright holders and lawmakers have been struggling to find an adequate response to online piracy for several years. Progress has been slow, but with pirate site blockades now in effect, there appears to be some movement. New research published by INCOPRO this week shows that traffic to blocked pirate sites has decreased 53.4% since the first measures were implemented a year ago. 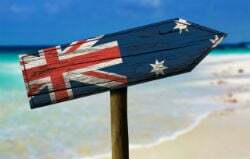 In total, usage of the top 250 pirate sites dropped a significant 25.4% in Australia. In summary, the research confirms that direct traffic to blocked sites has decreased dramatically. Or put differently, the site blocking efforts actually block pirate sites, which by itself should hardly come as a surprise. In fact, one might wonder how effective the blockades really are when nearly half of all direct traffic to the blocked sites in Australia remains intact and dozens of the country’s ISPs are involved. On top, it’s also worth mentioning that the research doesn’t take VPN usage into account. Australian interest in VPNs surged after the blockades were announced, so many people are likely to be circumvented the blockades using foreign VPNs. While VPNs were not factored in, the current research did look at proxy site traffic and concludes that this only substitutes a small portion of the traffic that went to pirate sites before the blockades. While it’s undoubtedly true that direct traffic to blocked sites has dropped, the research also includes some odd results. For example, it attributes a recent drop in Isohunt.to traffic to the blocking measures, when in reality the site actually shut down. “ISOHunt usage has been on a downward trend since December 2016, and is now at its lowest on record having reduced by 96.4% since blocking began,” the report reads, drawing on data from Alexa. Creative Content Australia (CCA) is happy with these results and states that the fight against piracy has claimed a significant victory. However, the anti-piracy group also stressed that more can be done. “The reduction in piracy is exciting news but that 53% could be 90%,” CCA Chairman Graham Burke says, using the opportunity to take another stab at Google. “The government has shut the front door, but Google is leading people to the back door, showing no respect for Australian law or courts let alone any regard for the Australian economy and cultural way of life,” Burke adds. INCOPRO’s research will undoubtedly be used to convince lawmakers that the current site blocking efforts should remain in place. With this in mind, the release of the report comes at an interesting time. The previously unpublished results were drawn up last December, but were only made public this week, a few days after the Australian Government announced a review of the site blocking measures.